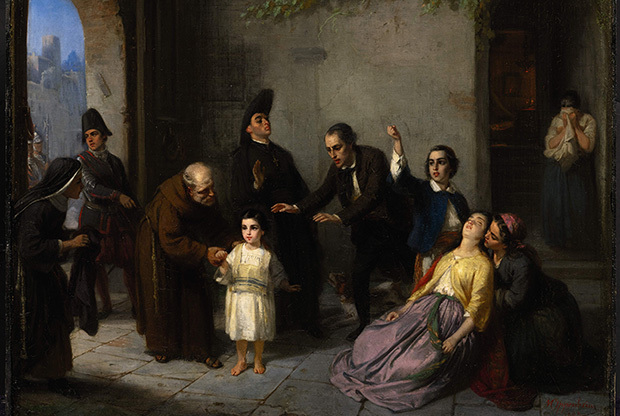 The Mortara Affair was an incident in which a six year old Jewish child, Edgardo Mortara, was forcibly removed from his family in June 1858 by the Carabinieri (the military police of the Papal States), placed in the care of the Church, and later adopted by Pius IX. This was because a Catholic maid (Anna Morisi), supposedly afraid that Edgardo was about to die, illicitly baptised him when he was an infant – or at least claimed to have done so. Years later she revealed this to Father Feletti, the inquisitor in Bologna. Whether Morisi really baptized Edgardo Mortara as claimed, or fabricated the story during her interrogation by Father Feletti in 1857, remains unknown. There were certainly inconsistencies in her account, which were highlighted during the trial of Father Feletti in 1860. Nevertheless, her story was accepted by the Church. The matter was referred to the Holy Office, which declared that the baptism was valid, and that according to papal law the boy must thus be removed from his family and brought to the House of the Catechumens in Rome to be raised as a Christian. 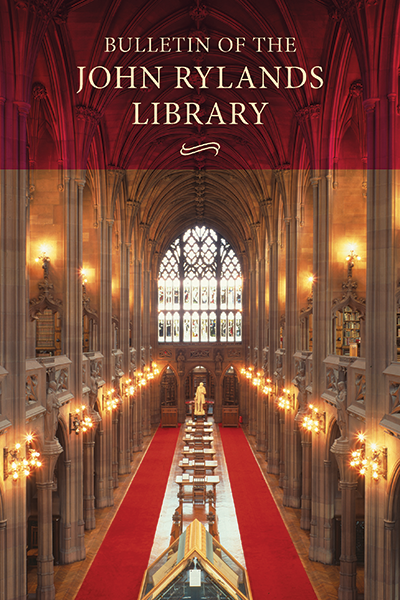 This episode is examined in detail by David Kertzer in his excellent book, The Kidnapping of Edgardo Mortara (New York: Vintage, 1998) [link]. Representation of the abduction by Moritz Daniel Oppenheim (1800-1882). 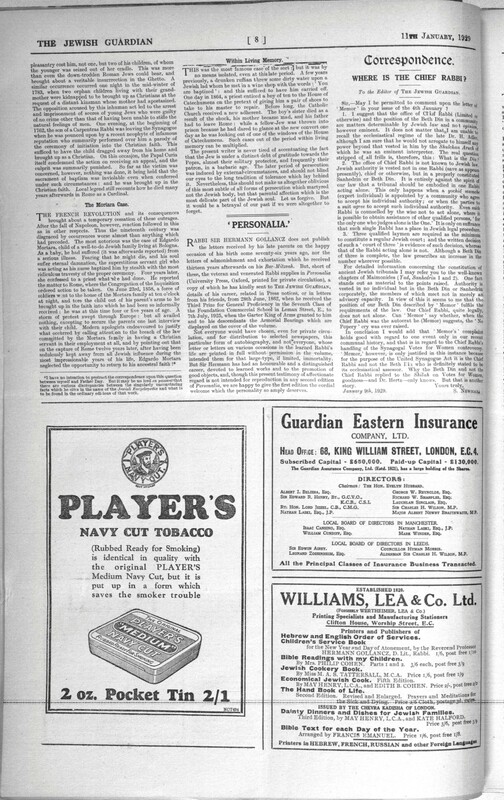 Returning to the subject in hand, whereas most British Catholic publications (such as The Rambler) simply ignored the reports of the Mortara abduction, and the pleas of the Jewish Chronicle for support in protesting against it, the Tablet went beyond silence and fully supported the Pope’s refusal to return the child. On 23 October 1858, following Protestant objections to Edgardo’s abduction by the Church, an editorial in the Tablet argued that an honest Catholic journalist can say nothing about it which Protestant readers will find gratifying. It was necessary, the editorial suggested, to take an “unpopular” stand despite the anticipated “obloquy” it would entail. The Tablet admitted that it adopted not only the “conclusions”, but also the “language” and the “arguments” of L’Univers – the French Catholic periodical of Ultramontanist Louis Veuillot. The Tablet thus presented L’Univers’s position on the Mortara Affair and endorsed it as if it were its own. According to the Tablet/L’Univers, Jews were the guests of the Church of Rome, and welcomed and protected in the papal territories, but whilst the civil law protects Jewish children from being coerced into baptism against their parent’s wishes (except “when in danger of death” or “when forsaken”), another law, of an earlier date, must take precedence: the “law of Christianity.” According to the Tablet/L’Univers, “baptism, which is necessary for salvation, makes us children of the Church.” It was suggested that in the case of the Mortara affair, the family had unwisely disregarded the law forbidding them to have Christian servants, and the maid, having seen the threat of death looming over an ill Edgardo Mortara, wished to make Heaven available to him, and thus baptized him, “legally, according to all appearance, validly, beyond all question.” As the young Mortara child was supposedly “no longer a Jew but a Christian,” it was apparently correct for him to be removed from his family, so that the parents “might not be tempted to make this Christian child apostatise either by violence or fraud, and so ruin a soul purchased by the blood of Jesus Christ.” The Tablet/L’Univers thus concluded that the Pope was right to refuse to bow to pressure, the paramount issue being the safety of a little child and a Christian soul. Untitled editorial with extract from Louis Veuillot’s L’Univers, Tablet, 23 October 1858, 680. A week later, on 30 October, the front-page news summary in the Tablet noted that “the Mortara case” was continuing to “engage the tongues and pens of men.” The Tablet again inverted the event, so that rather than a case of the Church kidnapping a child from his parents, it was transformed into a matter of the Church defending an innocent child in his choice of religion against the unreasonable demands of his parents. The paper argued that agitations about young Mortara were being provoked by the “maligners of the Holy See.” According to the Tablet, those who insist that the young Mortara child, “a baptised Christian, arrived at the age of reason” (the paper incorrectly stated that the child was eight rather than six years old, though the proposition remains dubious at either age), should be surrendered to his father, and thus raised “as a Jew, to deny his Saviour,” are in essence arguing that “this Christian child has no right, as against his father, to be protected in his religion.” The Tablet contended that the maligners who argue that the father has a “right to force his own religion on the child,” do so at the expense of the “interests of the child.” The paper concluded that the father does not have this right, and no one can “seriously contend” that he does. According to the Tablet, “a legal discussion, the validity of which, according to the law of Rome, is not disputed, has settled that the child Mortara is entitled to be protected in his [Christian] religion against his own father.” The Pope was thus being asked, the paper concluded, to violate the law of Rome, “in order to enable the Jew to force his child to deny the Divinity of Christ as Supreme Legislator”. 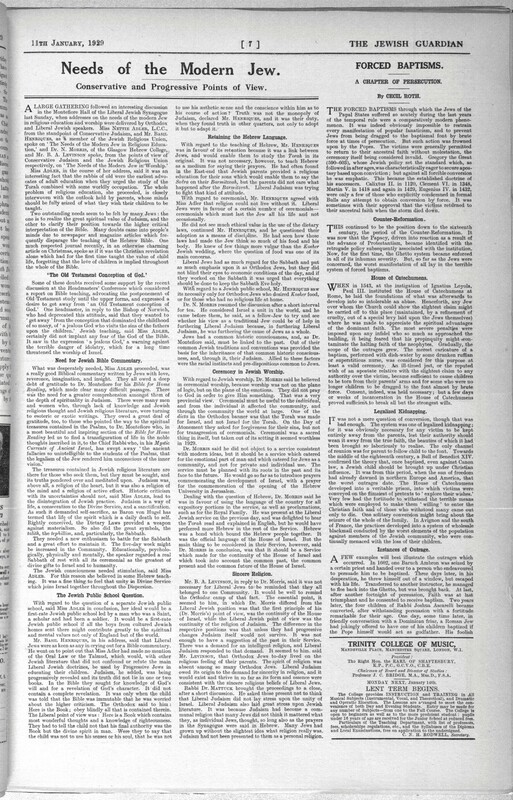 “Summary,” Tablet, 30 October 1858, 689. A week later, on 6 November, an editorial in the Tablet suggested that all that is required to resolve the Mortara question is the “little grace” necessary to receive the instruction of the Catechism as it is intended to be received; it concluded that “unfortunately, that little grace is wanting to the furious infidels who create the disturbance, and darken a question clear as the sun at noon.” According to the editorial: “The child Mortara has acquired rights which no human power can take away, but by violence, and for the loss of which no Government can ever make any compensation. The act which made him a Christian is irrevocable, beyond the powers of any tribunal to annul, and by that act he became as a dead child to his Hebrew father (so far as the authority of the latter over his religion was concerned), as completely as if he had died a natural death. Neither he nor his parents, it is true, consented to the deed, but that absence of consent cannot vitiate it, because the act of baptism once validly complete, remains for ever indelible, whatever may be his education or the future habits of his life.” The editorial again inverted the episode, transforming it from the kidnapping of a Jewish child into the protection of a Christian child in his so-called free choice of religion: “The child Mortara, by his baptism came within the jurisdiction of the judges in those [Papal] States, and had a right to the protection which they afford. They were bound to take care that an unprotected subject of the Pope should suffer no damage that they could prevent, and they would have been guilty of a dereliction of imperative duty, if they had not protected the child, as soon as they had ascertained that he had a legal claim to their help.” Invoking the stereotype of the Jewish “Pharisee,” the Tablet argued that the “British Christians” who side with Judaism over the Pope (whilst supporting Protestant societies for the conversion of Jews) are “Pharisees, who magnify the letter of their law, that they may easier kill the spirit.” On 13 November, the paper observed that when considering the Mortara case, “the readers of foreign journals must recollect that an immense proportion of [the journals] in France and Germany belong to Jews.” According to the paper, “Hebrews and Protestants will hunt in couples when Popery is on foot.” Untitled editorial, Tablet, 6 November 1858, 713; “Catholic Intelligence,” Tablet, 13 November 1858, 724. In summary, the Tablet agreed with Ultramontane publications in Europe, that the six-year-old child, having been (allegedly) baptized, was no longer a Jew but a Christian. It was necessary, the paper concluded, to remove the child from his parents in order to protect his soul from violence. The Tablet regarded it as entirely plausible that Edgardo, though only a young child, had freely abandoned Judaism, embraced Catholicism, and thus had a right to be “protected” against his parents in his so-called free “choice” of religion. It should be noted in conclusion that whilst the main British Catholic publications of the time (i.e. 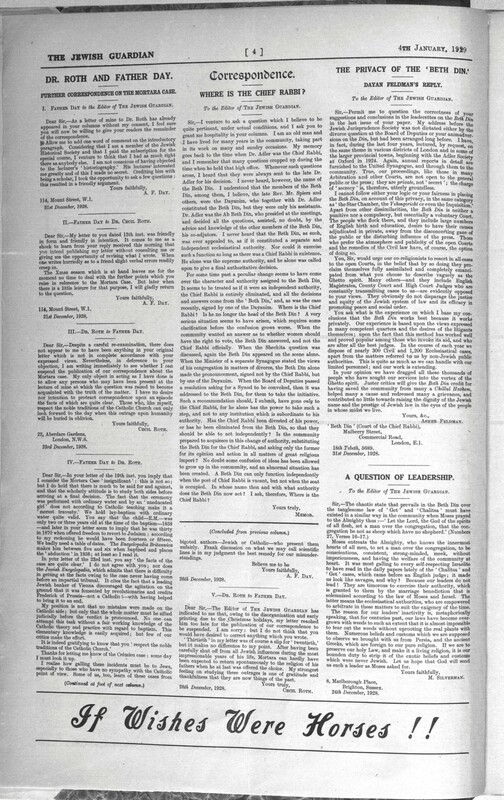 the Rambler, the Tablet and the Dublin Review) were either silent or supportive of the pope’s decision to hold on to the young Edgardo Mortara, this does mean that British Catholics in general – most of whom had little opportunity to make their views public – were happy about the abduction. 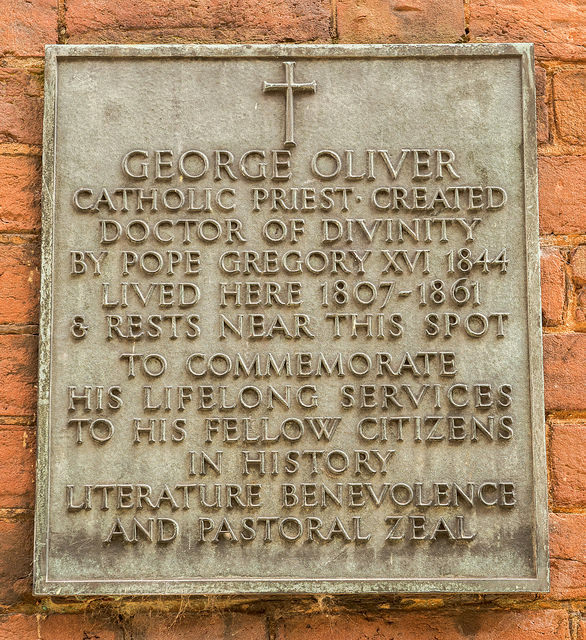 At least one prominent British Catholic, the Rev Dr George Oliver, a clergyman, antiquarian and local historian, who was made a Doctor of Divinity by Pope Gregory XVI in 1844, protested the act in a letter to Alex Alexander. 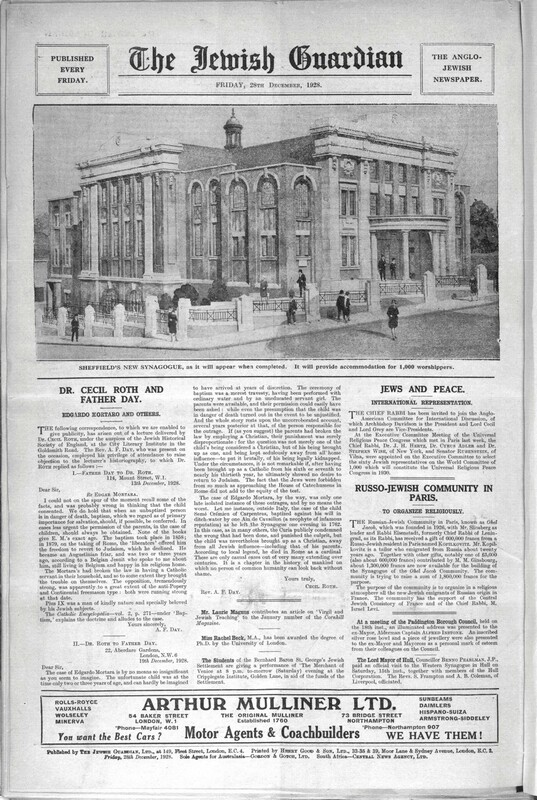 The letter was subsequently published in the Western Times and the Jewish Chronicle. According to Oliver, “a father has a natural right over his children, and without his free consent, it is unjustifiable in a Christian to attempt to baptise them.” He declared that the forcible abduction of a Jewish child on the pretence of a secret baptism by a Christian maid was “abominable”. Letter from George Oliver to Alex Alexander, “The Forcible Abduction at Bologna,” Jewish Chronicle, 15 October 1858, 3.